She graduated in piano, electronic music and composition at the Conservatorio di Musica Giuseppe Verdi of Milan. She studied composition with Niccolò Castiglioni, Bruno Zanolini and Alessandro Solbiati, piano with Lidia Arcuri, and electronic music with Riccardo Sinigaglia. At present, Delilah Gutman is completing a master’s degree in Discipline Musicali – Theatre Music Composition at the G. Rossini Conservatorio di Pesaro with Filippo Maria Cramazza. She studies singing with Sergio Bertocchi in Bologna. She has attended masterclasses with Gyorgy Ligeti, Gabriele Bianchi, Salvatore Sciarrino, and Luca Francesconi. The Fondazione Dragoni (Milan) awarded her a scholarship to study under Luca Francesconi. 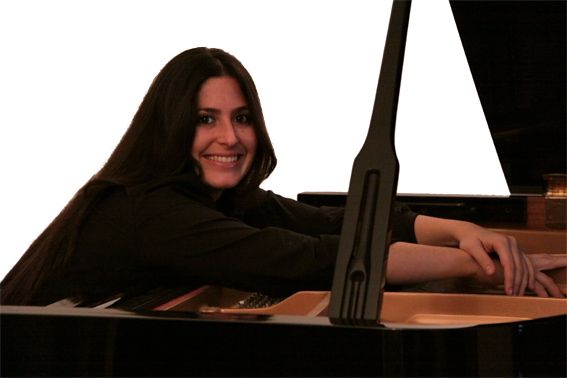 As a pianist and singer, Delilah Gutman is active both as a soloist in recitals and in chamber concerts in Italy and abroad. As a composer, she has to date over one hundred premières in Italy and abroad. As a teacher, she is constantly researching new teaching methods and putting them into practice with her students. Constant is her commitment to write for the youth in collaboration with different institutions. Among her many musical installations, readings, art exhibitions, and video art, in particular she has collaborated with the poets Manrico Murzi and Salvatore Ritrovato; writers Haim Baharier, Roberto Piumini and Guido Quarzo; and visual artists Mark Kostabi and Enzo Cucchi. In recent productions, she composed and interpreted the music for “Acqua”, a contemporary dance show (Titanz Company and Camerata del Titano), coreography by Vittorio Colella, which premiered at the Teatro Titano (Republic of San Marino) and selected for Vignale Danza Festival 2011’s (Torino) Italian première; “Kol bpm”(Giardini pensili and D.G.M.A. ), a concert for voice, clarinets and live electronics in collaboration with Roberto Paci Dalò, which was previewed in Bologna at Orea Malià for Arte Fiera 2011 and premiered at the Verucchio Festival 2012 directed by Ludovico Einaudi; “La memoria parla un canto” (Camerata del Titano), a musical exploration through the Jewish tradition for voice and violin, with the violinist Raffaello Negri. She collaborates with the Institut Archives Légales Amedeo Modigliani Paris-Rome, which is also a patron of her musical opera “Jeanne and Dedo”. Discography: “Y’did Nefesh” in “Soteira”, Jazz live improvisation – Palermo 2012; “Songs of light”, Ed.Acanto – Rimini 2011; “Serendipity”, Ed. Acanto – 2009 Rimini; “New Alliance”, Alinea Editrice – Firenze 2005; “La bussola perditempo”, Provincia di Rimini – Assessorato al Turismo – Rimini 2004; “Atmasfera”, Ed. Coiné – Forlì 2003. Sound track publication for documentary filmography: “ Love in Action” in “Kodeikkanal”, Garuda production 2007. Scores publications: “Mantra”, by Wicky Music Edition – Milano; “Letter to Morricone”, by Sinfonica Edition – Milano; “Calcutta in bianco e nero”, “Central Park”, Stonhenge”, “End”, “Tulipani”, “Le rose di Atacama”, “Sfera”, “Atma”, “Girotondo”, “Vento”, Pioggia”, “Altalena”, in the collection Atmasfera, by Sinfonica Edition– Milano. In 2012, she was appointed honorary friendship ambassador by the State of Israel.